A few days ago a researcher working on a TV bakery programme rang to say that she wanted 'to pick my brains' about 'the history of latticework tarts', as surprisingly Google and Wikipedia had not furnished any revelations on the subject. Funnily enough I had just filmed a short feature for a rival baking programme on puff pastry, in which I made the elaborate decorated lid for the baked pudding pictured above. So the subject was topical. Dishes like the good old woven pastry 'criss-cross' jam tart of modern England and the crostata of Italy have a venerable and surprisingly sophisticated history. Like other 'fossil' food practices, the contemporary survivals of this tradition are simplified and degraded when compared to those depicted in paintings and early book illustrations. In fact many made in the past were much more ambitious than those I have seen coming out of the ovens of modern bakers. The great heyday of this kind of pastry trellis work lasted from the second half of the sixteenth century to the first half of the eighteenth. The practice almost certainly had its origins in a burgeoning fashion for knotted strapwork ornament inaugurated by Mannerist architects such as Sebastiano Serlio (1475-1554). Interlacing decorations like those published by Serlio found their best known expression in architectural detailing and garden design, but food ornamentation was strongly influenced by the same zeitgeist. 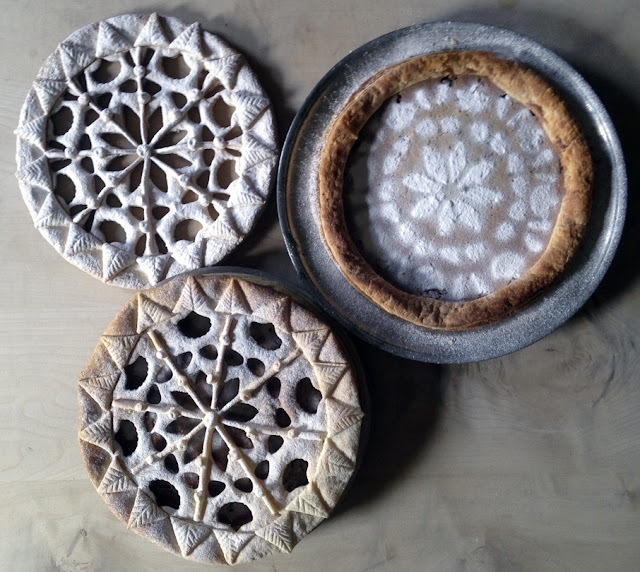 The curious knotted biscuits or sweetmeats known as jumbals emerge at this period and elaborate tarts and pies in kaleidoscopic knot-garden form start to adorn the tables of the wealthy. Edible strap work was all the rage. 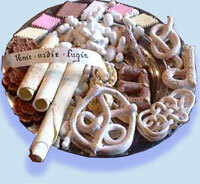 A plate of sixteenth century sweetmeats I made for Francis Drake's house at Buckland Abbey about fifteen years ago. The knotted biscuits are jumbals. All were copied from Netherlandish paintings of the period. Another expression of strapwork on the English table were designs painted on banqueting trenchers in the second half of the sixteenth century. Sometimes as here, these were made out of sugar paste and painted with edible colours. I made these sugar copies of some Tudor beechwood originals for a table display I created for Chatsworth House about eight years ago. 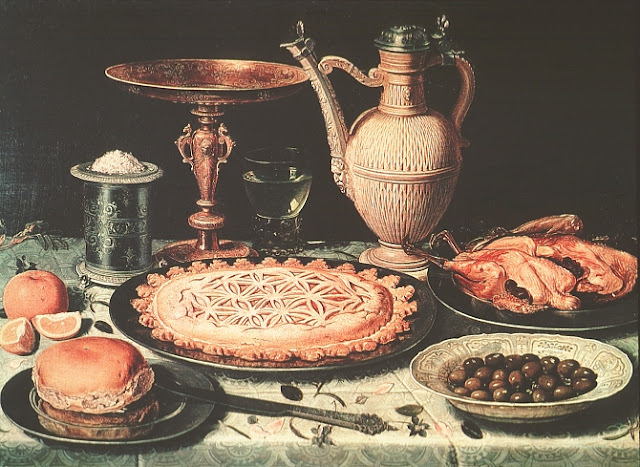 Although tarts with intricate strapwork lids appear from time to time in Netherlandish still life paintings like that of Clara Peeters below, it was not until the 1660s that designs for these tarts were published in recipe collections. A table setting by the Antwerp artist Clara Peeters (1594 – c. 1657) , including a pastry with a cut design, c. 1611, oil on panel. Museo del Prado, Madrid. Nothing to do with lattice work pastry, but note how Clara has painted the spit roast birds with their livers tucked under their pinions. When they did appear (with one major exception) they were exclusively to be found in English cookery texts. 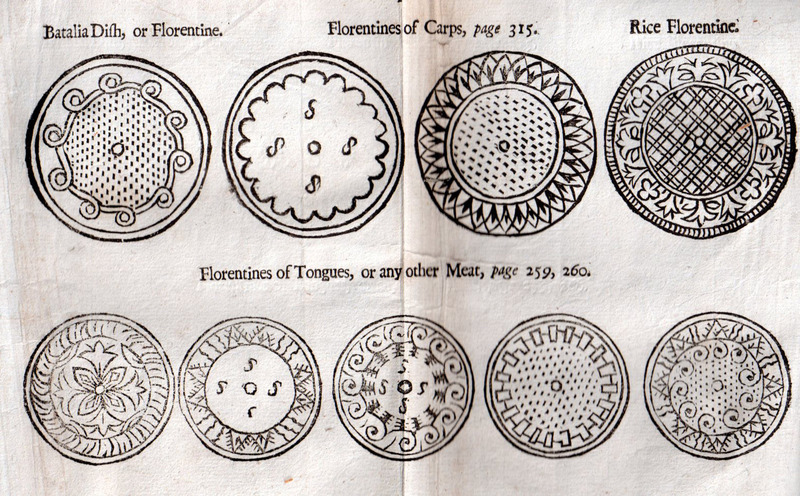 The designs below for Florendines are from Robert May's The Accomplisht Cook of 1660. Florendines were shallow pies filled with various kinds of meat or fish. May was not quite the first European cook to offer us designs for pastry ornamentation of this kind, as another Englishman, Joseph Cooper had included a few crude woodcuts of pie shapes in his The Art of Cookery Refin'd and Augmented (London: 1654). 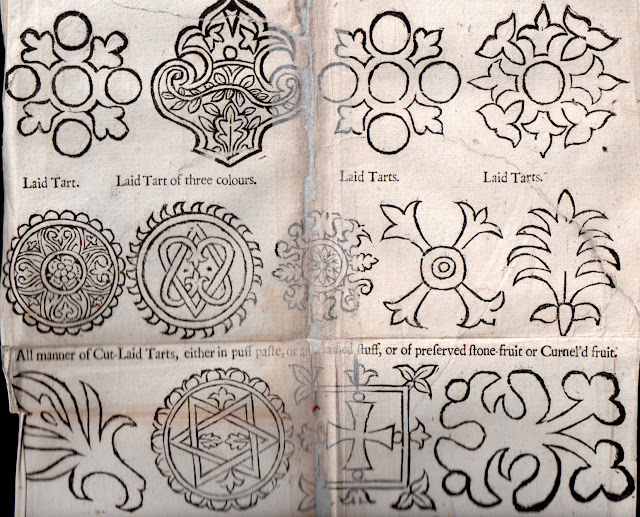 But May was the first to publish a wide variety of designs for different pastry types. 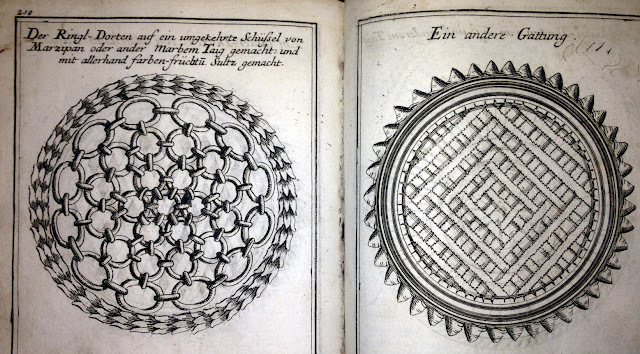 Although they are quite crude, his woodcuts give us an insight into the extraordinary lengths that pastry cooks went to in high status houses in baroque England. 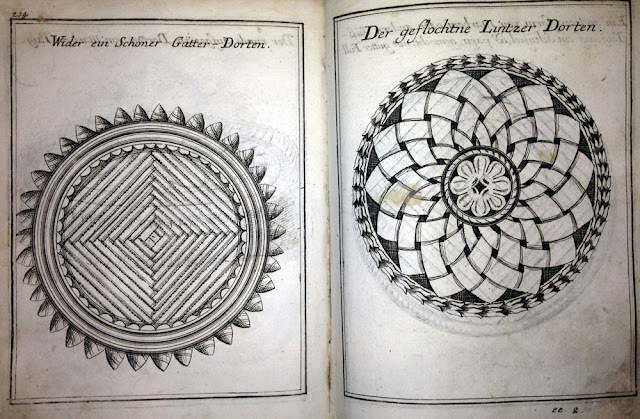 Other than a handful of English cookery books from the seventeenth and early eighteenth century, no other European printed texts contain designs like those of Robert May. Apart that is, from one notable exception from Austria, Conrad Hagger's Neues Saltzburgisches Kochbuch (Augsburg: 1719). This magisterial collection of recipes occupies a full horizontal five inches of my bookshelf and is one of the most important books I own. I often marvel at my good fortune, as I was lucky enough to buy a copy of this rare work in Liechtenstein for $50 in the 1970s! 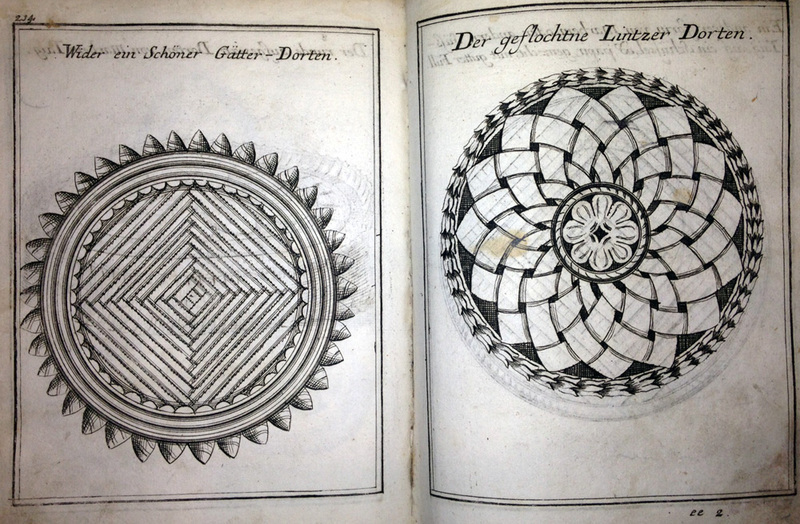 No other cookery text allows us such a detailed insight into the pastry techniques of the baroque Hofkoch than Hagger's work. Its 305 full plate engravings provide a bewildering variety of designs for pies, pasties, marchpanes and torts. 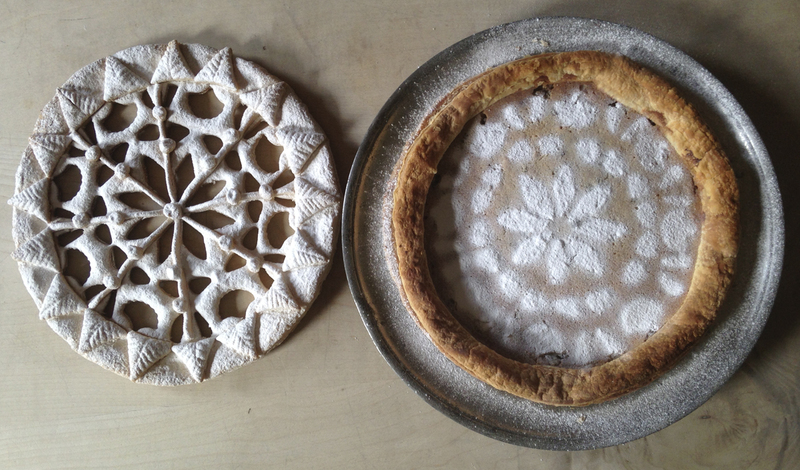 Here are some of his variations on the lattice work tart. Hagger's designs are very similar to those in May's book, but offer us far more detail. They indicate that the culinary expectations of his master Franz Anton von Harrach (1665-1727), the Prince Archbishop of Salzburg from 1709-1727, must have been very demanding. However, food in the Archbishop's palace appears to have been somewhat conservative and old fashioned. Elements of of the new French cookery style are present in Hagger's book, but many of his pie designs hark back to the previous century. He was an old man when he wrote his book and was probably documenting the cookery style of his heyday. Ecclesiastical households were much more conservative than princely ones and appeared to favour the old style of cookery. This is also apparent in the work of the English ecclesiastical cook John Thacker, who worked for the dean and chapter of Durham Cathedral between 1739 and 1758. Thacker's book The Art of Cookery (Newcastle upon Tyne:1758) was the last of the baroque recipe collections to contain illustrations of pastry work. Here is his design for a cover for a marrow pudding. Covers like this were usually made out of puff pastry and baked separately from the tart or pudding they adorned. Here is my interpretation of Thacker's design sitting on a sheet of paper on a baking tray and ready for the oven. Thacker gives no instructions for doing this, but I could not resist dusting the pudding with powdered sugar and then removing the lid. What a lovely effect! 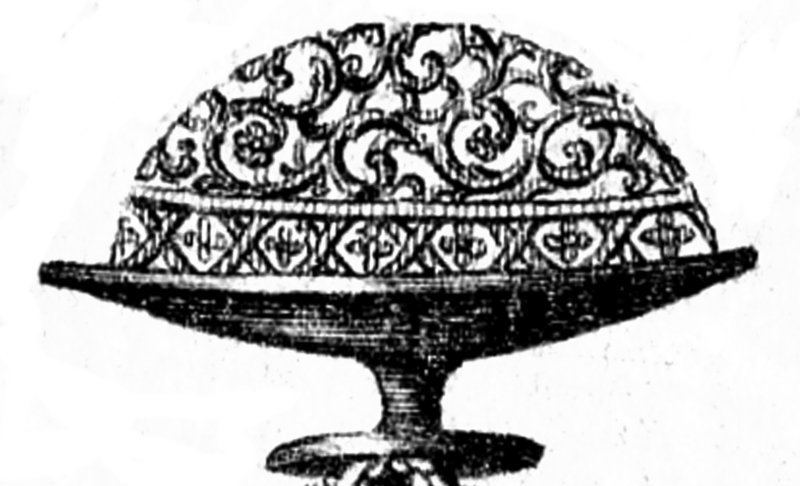 Nearly a century earlier Robert May had published directions and diagrams for making cut lids of this kind. 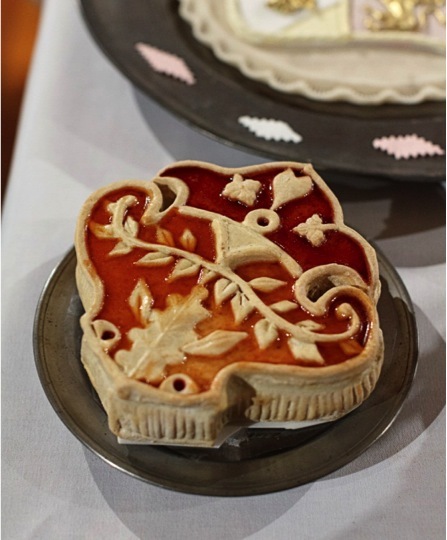 The shapes between the pastry 'slips' were designed to be filled with coloured preserves and fruit pastes, making some of them the most colourful baked goods in the history of English food. 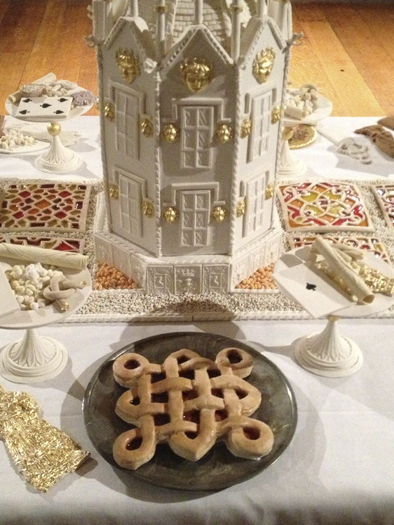 I made the cut laid tarts above, based on May's designs for my exhibition Supper with Shakespeare at the Minneapolis Institute of the Arts in 2012. 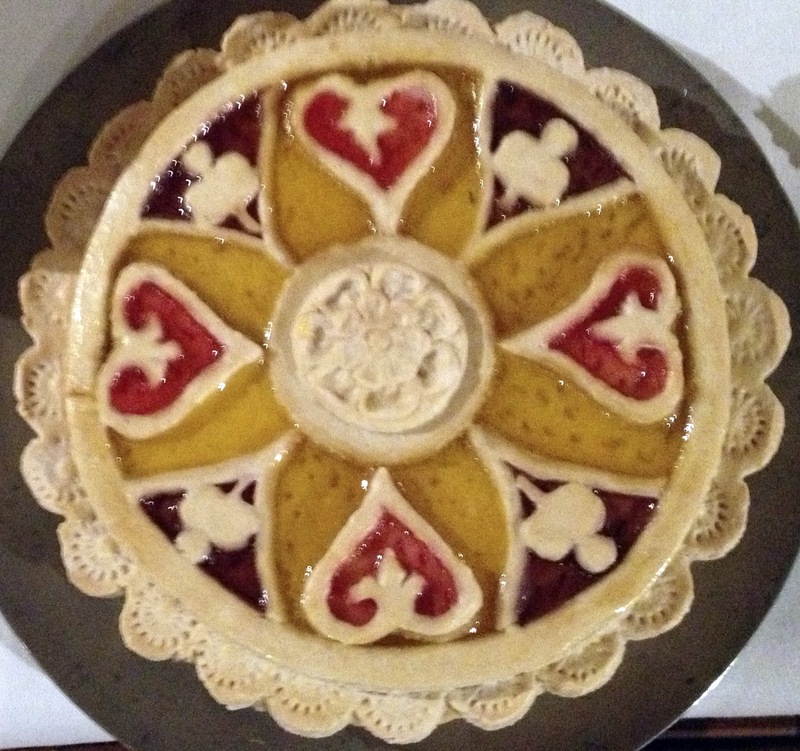 Towards the end of Shakespeare's life, Gervase Markham in The English Housewife (London: 1615) describes similar tarts, though unlike May, he does not offer any illustrations. These edible stained glass windows were the mothers of all jammy dodgers! 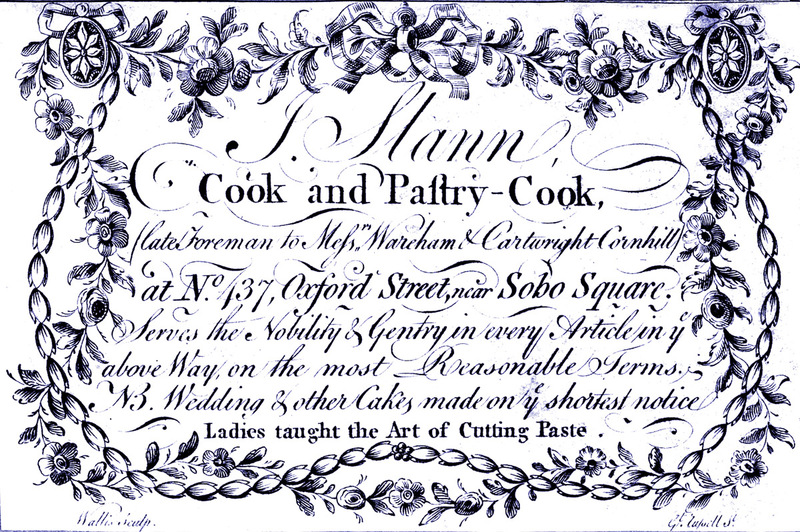 Cut pastry continued to be popular well into the eighteenth century. One kind that emerged was the 'crocant', a technically difficult genre which involved placing a sheet of a specialised crocant paste (sometimes called 'crackling crust') over a domed mould and then cutting it by hand with decorative designs in the form of leaves, birds, animals etc. They were baked on the domed moulds. 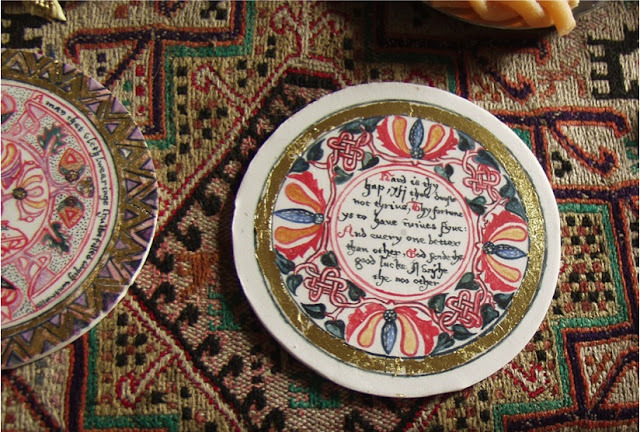 When finished, crocants were often iced and then placed over plates of colourful sweetmeats. We have a hazy idea of what these ephemeral creations looked like, because no specific designs have survived, though ceramic manufactories such as Wedgewood and Royal Copenhagen produced pierced lids for vessels which may have been influenced by these edible cut covers. However, we can be sure that standards were incredibly high and there were quite a lot of professional bakers and confectioners who were prepared for a fee to instruct ladies in the tricky art of cutting designs like this in pastry. We get a rare glimpse of a crocant in a tiny detail on a trade card for the London confectioner John Betterley who traded from 437 Oxford Street in the late eighteenth century. I am lucky enough to own a copy, so here is a scan of Betterley's crocant cover. Hi Ivan, again wonderful stuff.Dorothy Hartley illustrates some tart patterns, the last of the species maybe? The information on the "crocant". 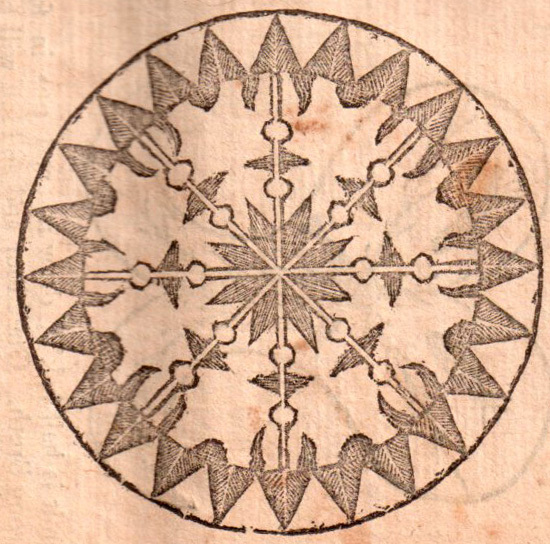 I have found instructions for making this in an 18th century Scottish texts, but could not quite picture what what it looked liked. Hi Adam. Yes. 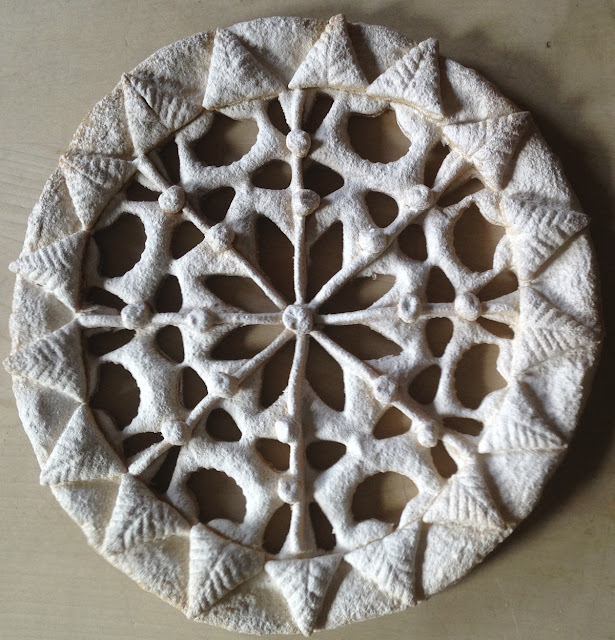 Dorothy Hartley's tart designs were almost certainly the tail end of this very old tradition. 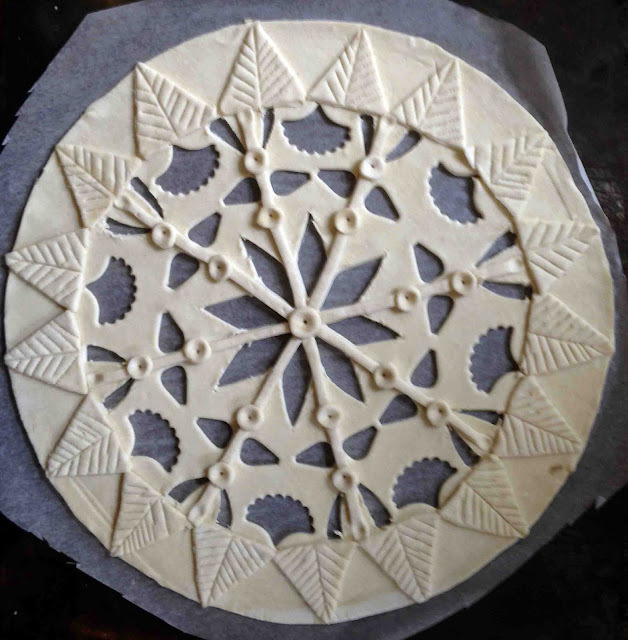 The process is too time consuming for modern bakers, who use various mechanical aids when making a lattice cover from pastry. Did you make your cut pastries completely by hand, or did you use some cutters or presses? These are amazing works of art and I am fascinated by the beauty and complexity shown in your interpretations. Nicola, You are not being a pain. These cut laid tarts were made by baking the decorative lid separately from the fruit tart they were intended to cover. The lids were made of puff pastry. 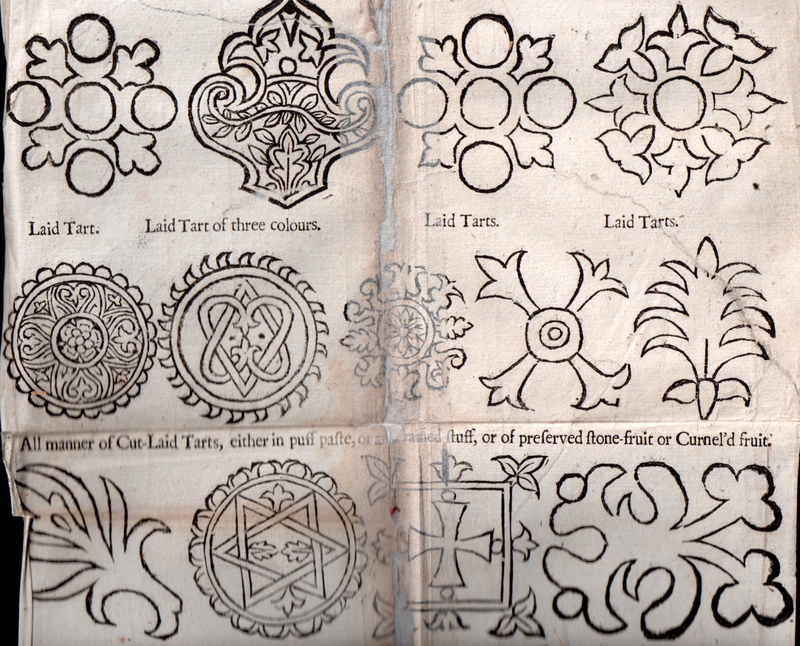 Brief instructions are given and some detailed diagrams included in Robert May, The Accomplisht Cook (London: 1660). The spaces were then filled with coloured fruit preserves. Similar baked goods were also made in Austria. They can look very impressive. I hope this helps.